The Watermark is open 7 days a week from 7AM till late every night serving breakfast, lunch & dinner all day every day! 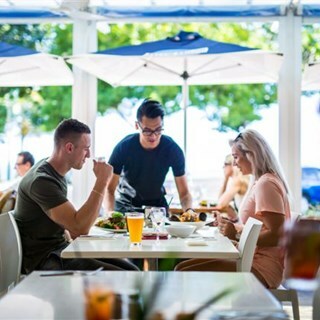 The Watermark Restaurant is perfectly located on the Strand in Townsville showing ocean views from your table. The restaurant offers ample seating from couples to very large groups. We serve everything from freshly squeezed orange juice to high teas including all courses, likes and tastes. 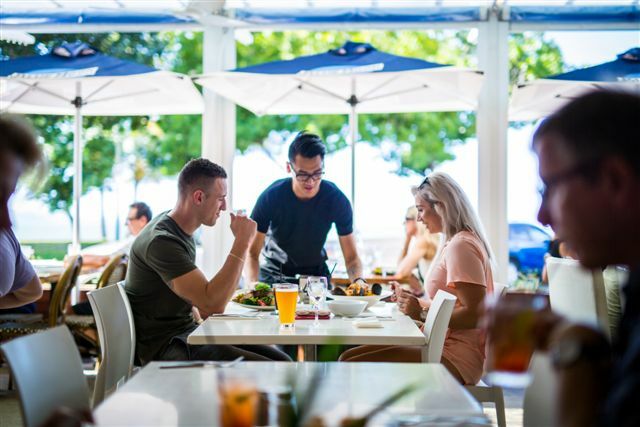 The dining experience is met with an excellent selection of entree's, mains & desserts using quality meats, fresh seafood, crisp fruit & vegetables all cooked by a great team of chefs. Our attentive staff will ensure that your served promptly, without mistake and making your experience one to remember. Busiest brekkie day of the year. Although there was a bit of a wait for food you got it right by keeping us topped up with coffee and drinks. Patient and pleasant service although you were obviously run off your feet. And when the food arrived it was as good as always! Well done! if those unbrellas  could move on an angle would be good as we were in the sun all morning. Danny makes the very best Martinis. Great location, great service, great food what else do you need? It’s a no brainer 5* all the way, highly recommended, if they have the lobster on the menu it’s a MUST. Excellent service, brilliant food, great atmosphere! I had great expectations of a 4.5 star rated restaurant. Unfortunately, my pizza arrived prior to the starter and the seafood platter being shared by two work colleagues arrived later then these two dishes I ordered. The meal sequencing was poor. Despite the apology from staff member I had a higher expectation. I would also not consider the meals to be great value for money. Probably overpriced by $5-10 per meal. This was the first time at Watermark but it won't be the last! The food was amazing, even the kids meals! We will be back! Great spot and food good. The calamari and stuffed prawns were delicious! The food is over priced and not value for money. $40 for an unseasoned piece of fish and steamed vegetables. We were seated at plastic tables and chairs close the bar area. There send to be an obsession with a bell on the counter. The manager there really likes to hit the bell to cal his staff for service. We will never return to the restaurant and definitely would not recommend. Wonderful variant menu and attentive service. The settIng is ambient and relaxed. Our meals all came to the table at the same time which was great and all beautifully presented, fresh and tasty. Fantastic service and food and always. On a day when Townsville shone in its September splendour, so did the Watermark. Our group enjoyed an exceptional dining experience over lunch and will definitely be back. Our visitors from Melbourne and Toowoomba were really impressed with the restaurant, we all had had a lovely dinner.